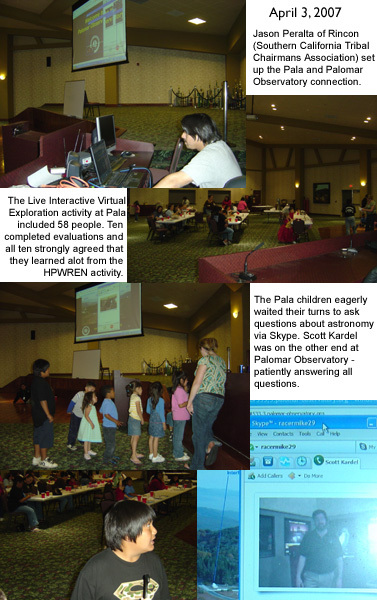 The Pala Native American Reservation recently hosted a Live Interactive Virtual Exploration (LIVE) activity, which allowed participants to "tour" the Palomar Observatory via HPWREN and the Tribal Digital Village Network (TDVNet). The activity featured on-site curricula prepared by Kisa Collins of the Pala Learning Center and a remote lecture by Scott Kardel of the Palomar Observatory. 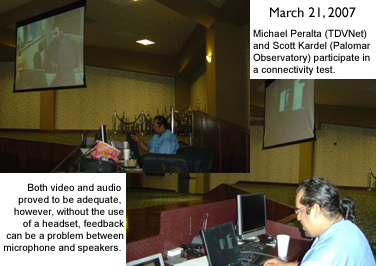 A connectivity test on March 21 was conducted prior to the April 3 event, which was attended by Pala tribal members as well as interested people from the community. Overall, there were nearly 60 people at the LIVE activity - ranging from three-years-old to sixty-years-old. "This was a great opportunity to tour the Observatory and learn more about it, and also visit with one another about other education opportunities for the young ones on the reservation," said one attendee via her evaluation survey. "My children loved the pictures of the stars and they learned enough that it made them want to visit the telescope at the Observatory in person," remarked another LIVE participant. "I was happy to provide this experience for the Pala community," said Scott Kardel, Public Information Officer at the Palomar Observatory. "It was especially great to hear the questions from the kids - they were very interested and that is what made this LIVE activity so successful." The Pala Learning Center now plans to take the children on a tour of the Palomar Observatory, so that they can experience the telescopes in person. "This was a terrific way to introduce astronomy and the nearby observatory to our students," said Pala Learning Center Coordinator Kisa Collins. "We are anxious to participate in more such activities to provide our kids with additional science education activities."